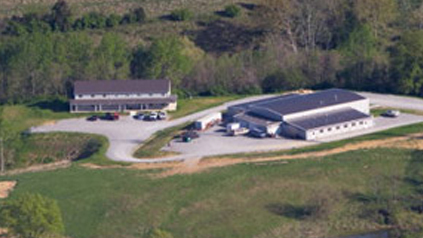 Situated on 40 acres of rolling pasture, the new Kentucky Horseshoeing School exceeds all expectations. 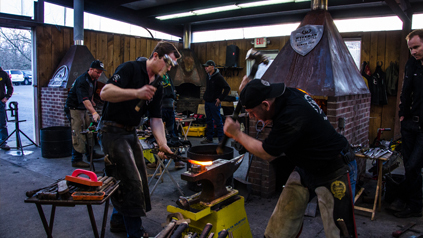 The new, premier facilities, including 23,000 square feet of classrooms, shops and instructional areas along with beautiful energy efficient dormitories, puts Kentucky Horseshoeing School among the best of the farrier education facilities operating today. Founded in 1978, the Kentucky Horseshoeing School has continually focused on primary and continuing education, drawing upon the best of traditional practices as well as the newest research to become the premiere farrier education center in North America. Our curriculum, our staff, and our facilities continually evolve to reflect state-of-the-art shoeing methods and materials as well as the latest insights into balanced shoeing. Both working professional farriers and KHS students benefit from our educational programs, designed to provide the farrier community with a thorough understanding of the current techniques and the latest skills required for providing hoof and leg health. Our instruction focuses upon understanding balanced shoeing through a combination of intense anatomy, physiology and biomechanical training as well as practical work. Through a deep and thorough understanding of the equine’s biomechanical processes, our students understand “why” along side of “how” when formulating a hoof care plan. Throughout North America and around the world, you will find KHS graduates working at the top of the farrier industry, shoeing world champions of all breeds and providing leadership within the farrier and equine communities. Whether you are a Veteran of the United States Military, a recent High School graduate, or something in between—the Kentucky Horseshoeing School will put you on the road to your own personal success as a quality horseshoer. 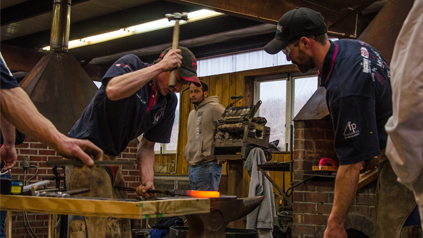 Committed to advancing the farrier’s craft and the heritage it was built upon, the Kentucky Horseshoeing School’s goal is to educate our students to be the very best entry-level farriers in the country. What does a day look like? You can view facility photos in our Gallery; however, no photo can adequately depict the scale and function of our new campus so stop by and see it for yourself. We are open Monday-Friday from 9am – 5pm.